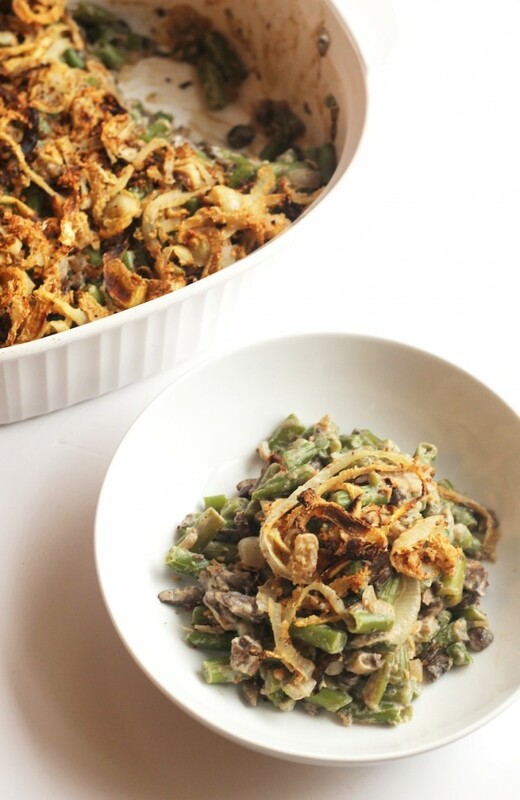 Let’s talk about this Healthy Vegan Green Bean Casserole. The secret is the cashews! Soaking them and then blending them with unsweetened almond milk creates this insanely thick and creamy addition that transforms the mushroom mixture into decadent heaven. For the onion topping are tossed with whole grain breadcrumbs and flour and baked in the oven until nice and crispy. Not only are you using fresh onions as opposed to ones that have been in a can for God only knows how long, but there’s also no extra oil involved! This ultra creamy healthy version of the classic green bean casserole tastes so decadent that you'll never guess it's dairy and guilt-free! Vegan and gluten-free. Meanwhile, preheat oven to 475F. Thinly slice two of the onions, setting aside the other onion for later. Combined sliced onions with bread crumbs, flour and ¾ tsp salt in a large bowl, tossing to combine. Be sure to separate each individual onion piece. Spread onions in an even layer on a baking sheet sprayed with cooking spray or lined with a Silipat. Spray once again with cooking spray. Bake for about 20 minutes, tossing halfway through. Watch carefully to make sure they don't burn towards the end of cooking. Once onions are done, remove from oven and lower oven heat to 350F for casserole. In a large skillet, heat olive oil over medium heat. Chop remaining onion. Once hot, ad to pan and cook for about five minutes before adding garlic and mushrooms. Cook for another ten minutes, stirring often. Add nutmeg, soy sauce, white wine, 1½ tsp salt, and pepper. (It will taste salty, that's ok!). Simmer for about five minutes. Spread mixture into prepared dish. Top with remaining baked onions. Bake at 350F for 20 minutes (if onions are on the crispier side, you can cover with foil for first half of cooking.) Serve hot! 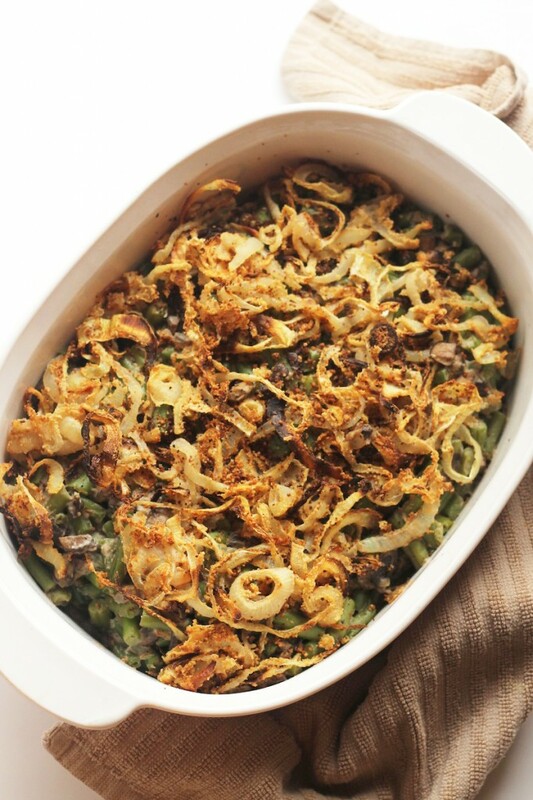 0 Response to "HEALTHY GREEN BEAN CASSEROLE (VEGAN + GLUTEN-FREE)"